Diamonds are so last year. This year it is all about gold. 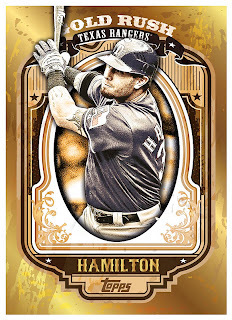 The Golden Giveaway, Golden Moments inserts and real Gold cards are all a part of the 2012 Topps Baseball Series of cards. 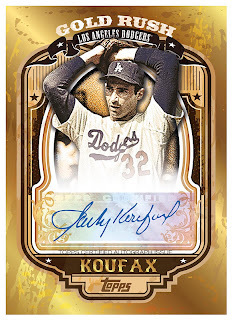 But for the soon to be released Series 1, Topps is offering a gold themed wrapper redemption program. For every 50 Hobby wrappers or 14 HTA Jumbo wrappers of 2012 Topps Baseball Series 1 you send to Topps, you will receive a 5-card cello pack of exclusive Gold Rush cards. There are 50 cards to collect in all. In addition, bonus autographed cards have been randomly inserted into packs from signers that include Willie Mays, Adrian Gonzalez, Sandy Koufax, Nelson Cruz, Albert Pujols, Albert Belle, Dennis Eckersley and more. But you will have to be quick about it. The exclusive wrapper redemption program will be available only for the month of February. Packaged wrappers sent to Topps must be post marked no later than February 29th, 2012. You may and are encouraged to group all of your wrappers into 50 hobby or 14 HTA bundles and send them together in one package. Topps will fulfill all wrappers submitted until supplies last.